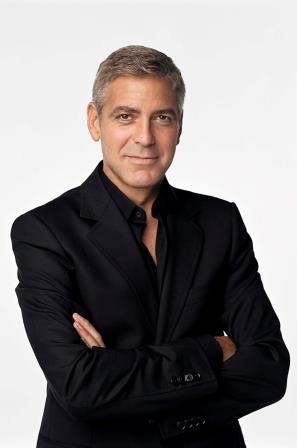 George Clooney will award the 100 LIVES inaugural Prize at a ceremony to be held in Yerevan, Armenia on 24 April, 2016. NEW YORK, March 10, 2015 /PRNewswire/ -- The 100 LIVES initiative is launching today expressing gratitude to the individuals and institutions whose heroic actions saved Armenian lives during the Genocide 100 years ago. The 100 LIVES initiative was founded by international businessmen and philanthropists Ruben Vardanyan and Noubar Afeyan and humanitarian Vartan Gregorian to demonstrate the impact of the Armenian Genocide and how many of the survivors and their families went on to lead successful lives making significant contributions to global culture, the arts, sports, science and business. An estimated 1.5 million died during the Armenian Genocide between 1915 and 1923. Around 500,000 survived, many through the intervention of individuals and institutions and there are now Armenian Diaspora communities around the world from Argentina to Australia. "The humanity, generosity, strength and sacrifice shown by those who saved so many Armenians compels us to tell these stories," said Ruben Vardanyan, co-founder of 100 LIVES. "Now is the time to shine a light on those most extraordinary lives, to build on the lessons they teach us, and to express our gratitude for what they did." Along with honoring past survivors and saviors, the program will establish the Aurora Prize for Awakening Humanity as a means to empower modern-day saviors. The annual grant of $1 million will be awarded to a recipient who will, in turn, present it to the organization identified as the inspiration for their action. The Aurora Prize brings together leading human rights luminaries from around the world including Academy Award winner George Clooney, Nobel Peace Prize winners Elie Wiesel and Oscar Arias, former UN High Commissioner for Human Rights, Mary Robinson, UN Secretary-General Advisor on Genocide, Gareth Evans, globally respected human rights activist Hina Jilani and President of the Carnegie Corporation of New York, Vartan Gregorian, to serve on its Selection Committee. Mr. Clooney will award the inaugural Prize at a ceremony to be held in Yerevan, Armenia on 24 April, 2016. "I am honored to be associated with 100 LIVES as it shares a common mission with my foundation, Not On Our Watch, to focus global attention on the impact of genocide as well as putting resources towards ending mass atrocities around the world," said George Clooney. "It should weigh heavily on all of us that genocide still takes place today," he added. "We have to tackle this head on—as individuals, as communities and as governments." Mr. Clooney will join renowned human rights advocate and chairman of the American Holocaust Memorial, Elie Wiesel, as co-chairman of the Prize's Selection Committee. Additional members will be named over the next few months to complete the committee and provide human rights expertise from every geographic region in the world. "I have personally witnessed the devastation that genocide wreaks, which sadly continues today," said Elie Wiesel. "But I also recognize the resilience of the human spirit," he continued. "We must remember and honor the remarkable efforts of those saviors who intervened a century ago to prevent such atrocities from ever happening again." The Aurora Prize was named after Aurora Mardiganian who, as a child, was forced to witness the atrocities of the Armenian Genocide, including losing her father and brothers. Against the odds she survived and went on to devote her life to providing humanitarian relief and raising awareness of the Armenian Genocide, including starring in a famous film called Ravished Armenia in 1919. The Prize is also inspired by the thousands of untold stories of courage and survival during these events a century ago. "Resilience, strength, survival and gratitude are characteristics exhibited by Armenians, though not by us exclusively. They are found in all people," commented Noubar Afeyan. "We developed the concept of #BeArmenian #BeAlive to encapsulate the strength of the human spirit—not just for Armenians, but for everyone." As part of its efforts, 100 LIVES also hopes to digitize the written record of the Armenian Genocide, a substantial undertaking, yet one which the founders believe can help safeguard the historical archive in perpetuity and ensure it can be accessed by anyone. "There are a small number of survivors of the Armenian Genocide left with us. It is crucial that we ensure that, as we approach the centennial, we take this opportunity to leave a lasting imprint of what happened a century ago onto the world's collective conscience," remarked Vartan Gregorian. 100 LIVES is launching a global call for the descendants of both saviors and survivors to share their remarkable stories. It will bring these stories to life and tell many stories over the lifetime of the initiative. 100 LIVES will invest in projects, as a tangible expression of gratitude. We want our actions to help inspire others to stop, to think about those who have helped them during a crisis, and to express gratitude by doing something in return. 100 LIVES will leave a lasting act of gratitude through its fundraising and grants program. The funding will be invested in Gratitude Projects relating to Armenia, countries with a strong Armenian diaspora, or countries with links to the people, families, institutions or communities that saved and helped Armenians 100 years ago. Projects are aimed at expressing Gratitude to and raising awareness of the people and organizations that gave Armenians a second chance and creating a better future for younger generations. Not On Our Watch was founded by George Clooney, Don Cheadle, Matt Damon, Brad Pitt, Jerry Weintraub, and David Pressman to focus global attention and resources to stop and prevent mass atrocities. Drawing upon the voices of cultural leaders, our mission is to protect and assist the vulnerable, marginalized, and displaced. Elie Wiesel and his wife, Marion, established The Elie Wiesel Foundation for Humanity soon after he was awarded the 1986 Nobel Prize for Peace. The Foundation's mission, rooted in the memory of the Holocaust, is to combat indifference, intolerance and injustice through international dialogue and youth-focused programs that promote acceptance, understanding and equality. Re: George Clooney will award the 100 LIVES inaugural Prize at a ceremony to be held in Yerevan, Armenia on 24 April, 2016. Here's another article. And the first prize will be awarded in April 2016.. Leaders in the Armenian diaspora, preparing to commemorate the 100th anniversary of the Armenian genocide, have collaborated with Hollywood celebrities and human rights advocates to create a prize to be awarded annually to those who put themselves at risk to ensure that others survive, The New York Times reports. The humanitarian prize, to be announced on Tuesday in New York, is part of an expansive effort by prominent Armenians to ensure that the history of the genocide by Turkish Ottoman troops, which is still disputed by Turkey’s government, is documented and archived through the stories of survivors and their saviors, in ways similar to the chronicling of the Jews’ suffering in the Holocaust. The effort, the Armenian sponsors said, will emphasize how survivors of the genocide — people who in some cases were protected by sympathetic Turks — went on to lead successful lives as they and their descendants spread throughout the world, many of them relocating to Russia and the United States. About 1.5 million Armenians died from 1915 to 1923 in what is widely acknowledged as the 20th century’s first genocide. About 500,000 survived, many because of interventions by foreign individuals and institutions. The official commemoration of the genocide in Armenia begins next month. “The humanity, generosity, strength and sacrifice shown by those who saved so many Armenians compels us to tell these stories,” said Ruben Vardanyan, an Armenian investment banker and philanthropist who grew up in Russia and is a co-sponsor of the commemoration effort, known as the 100 Lives Initiative. “My grandfather was saved by a missionary,” Mr. Vardanyan said in an interview, crediting his existence today to that event. Along with commemorating the survivors and those who saved them, the effort will establish a $1 million award, to be called the Aurora Prize for Awakening Humanity, to be given starting next year. The winners will not keep the money, instead presenting it to the organizations that they identify as the inspirations for their work. Mr. Vardanyan and his associates collaborated with Not On Our Watch, an organization founded by George Clooney and other celebrities — including Don Cheadle, Matt Damon and Brad Pitt — that seeks to prevent mass atrocities. Its principal undertaking in the past few years has been to document, through satellite imagery, evidence of possible atrocities in parts of Africa; the effort is known as the Satellite Sentinel Project. Members of the selection committee for the prize, which has yet to be finalized, resembles a Who’s Who of personalities in human rights advocacy and Armenian success. They include Mr. Clooney as well as the Nobel Peace Prize winners Elie Wiesel and Óscar Arias; Mary Robinson, a former United Nations high commissioner for human rights; Gareth Evans, an adviser to the United Nations on genocide prevention; and Vartan Gregorian, an Iranian-born American academic who is president of the Carnegie Corporation of New York. Mr. Clooney is to award the inaugural prize at a ceremony to be held in Yerevan, the capital of Armenia, on April 24, 2016, the sponsors said in a statement. Not On Our Watch Board member, John Pendergast will become a strategic consultant to the Prize and George Clooney will become Co-Chair of the Prize selection committee, joining Nobel Laureate and renowned author Elie Wiesel. Isn't that the official ceremony for the Genocide Anniversary? I wonder if Amal will be asked to speak or take part in some way, other than as an attendee. I guess Money Monster will be done shooting here by then - or maybe they'll fly over just for the event and then head back to NY. So this year the 100 year anniversary and next year the first 100 Lives Inaugural Prize ceremony? Oh Are those two different Events? I thought it is one. If it's two I can seperate the threads again. Maybe one article did a typo in the year? PAN - you will know right? My understanding is that the Genocide 100 years commemoration in Yereven is not the same as the Aurora Award (next year). I expect those who go to Armenia may be involved in both, and I wouldn't be surprised to see Geoffrey Robertson there too, and of course his book on the events 100 years ago is available. Might be wrong. OK I'm really confused now. Would George really travel 2 years in the row to Armenia? and why would they do the Award Show in 2016 when the 100 anniversary is this year? The [url=http://www.todayszaman.com/index/turkish government]Turkish government[/url]'s move this year to invite more than 100 leaders around the world for the centennial commemorations of the Gallipoli Campaign of World War I to be held on the same day as the Armenians' centennial commemoration of what they call the “[url=http://www.todayszaman.com/index/armenian genocide]Armenian genocide[/url]” has been perceived as a crude attempt to distract attention from the Armenian commemorations. In an attempt to reduce the impact of the centennial commemoration ceremonies of the Armenian “genocide” this year on April 24 in Armenia, the ruling Justice and Development Party (AK Party) has come up with the idea of celebrating the 100th anniversary of World War I's Gallipoli Campaign on two-day-long ceremonies on April 23-24. Turkey traditionally commemorates its fallen soldiers in the Battle of Gallipoli -- also known as Çanakkale on March 18 every year. But just two years ago, then-president-Abdullah Gül marked the 98th anniversary of the Çanakkale Battle on March 18 in 2013. No one in Turkey at the time suggested that the Çanakkale Battle should be remembered on April 24. March 18 is the day the British started its bombardment of the Dardanelles peninsula. The Gallipoli commemorations will take place on April 23-24 this year for the first time and the Turkish government has sent invitations to more than 100 leaders around the world, whose soldiers fought in World War I, including Armenian President Serzh Sarksyan. Foreign Minister Mevlüt Çavuşoğlu had to explain last week that other ethnic groups, including Arabs and Armenians also fought at Gallipoli. “We [Turks and Armenians] fought together at Gallipoli. That's why we have extended the invitation to President Sarksyan as well,” he said. Richard Giragosian, director of the Regional Studies Center (RSC), an independent think tank in Yerevan, said the timing of the Gallipoli invitation could not have been worse. “In fact, in what seems to be a rather selective reinterpretation of history, the Turkish government has set the two-day Gallipoli commemoration for April 23-24, in a blatant disregard for the traditional April 24 commemoration of the Armenian genocide,” said Giragosian in an email reply to Today's Zaman. Armenia is preparing a wide-scale anniversary ceremony for the 1915 events on April 24 and invited a number of leaders around the world. French President François Hollande and US President Barack Obama are among those invited to Yerevan for the ceremonies in Armenia. Yerevan commemorates the mass killings of Armenians every April 24 and often use the anniversary as an opportunity to lobby Western countries to brand the killings as genocide. Ankara denies claims that the events of 1915 amounted to genocide, arguing that both Turks and Armenians were killed when Armenians revolted against the Ottoman Empire during World War I in collaboration with the Russian army, which was then invading Eastern Anatolia. Giragosian pointed out that there are concerns over recent developments in Turkish politics. “For one, the rapid rise of President Erdoğan as the most powerful, but most polarizing politician is a cause for worry. And given his rather unpredictable and inflexible personal posture on many issues, there is concern that he will have and hold too much personal and political power, without due deference to the rule of law or democratic institutions within Turkey,” he said. “At the same time, the future of both Turkey's broader regional policy and its more specific policy towards Armenian-Turkish normalization are ever more hostage to the outcome of domestic Turkish politics,” Giragosian added. Erdoğan's invitation could be interpreted as an olive branch to Armenia, with which Turkey has no diplomatic relations. But Sarksyan in his letter to Erdoğan last week indicated his doubts about the sincerity of the invitation and expressed his expectation that Turkey will reply first to Armenia as to whether it will attend the ceremonies to commemorate the Armenian “genocide” in Yerevan. “For his part, the Armenian president had little choice but to reject the invitation,” said Giragosian. Last year, the Turkish government pulled another trick from its bag, only one day before April 24 to reduce the impact of the April 24 commemorations by Armenia. In a historic first for the Turkish Republic last year, Erdoğan, who was prime minister at the time, extended Turkey's condolences to the grandchildren of Armenians who had lost their lives in 1915. The statement, which doesn't include the word “genocide,” was welcomed by the West and Armenians living in Turkey, but was short of satisfying Yerevan. Another “olive branch” to Armenians came this week from Prime Minister Ahmet Davutoğlu. The prime minister released a statement on Tuesday to commemorate slain Armenian-Turkish journalist Hrant Dink eight years ago and called for a new beginning in Turkish-Armenian relations. He stated that a relocation policy and the events of 1915 took place under the harsh conditions of World War l, and Turkey shares the pain of Armenians. “Our desire to share pain, heal wounds and re-establish friendships are sincere. Our prospect is friendship and peace,” Davutoğlu said. Turkish Foreign Ministry spokesman Tanju Bilgiç also denied on Wednesday that Erdoğan's message for Armenians last year and Davutoğlu's statement addressed to Armenians are “tactical” steps to reduce the effects of centennial commemorative events of 1915. Armenian Foreign Minister Edward Nalbandian, who was visiting Brussels to attend the Armenia-EU Cooperation Council on Jan. 20, told journalists that it's not appropriate to organize the Gallipoli commemoration events in Turkey on April 24. “I don't think it is appropriate to organize such an event in Turkey on April 24 and I couldn't believe that anybody could perceive this as a proper step,” said Nalbandian. He also recalled that the Armenian president had invited Erdoğan to participate in the commemoration of the 100th anniversary of the Armenian “genocide” in April 2015. “I conveyed the written invitation to President Erdoğan being in Ankara in August of last year,” said Nalbandian. He had attended President Erdoğan's inauguration ceremony in Ankara in late August. “Till now we haven't received any response,” he added. Mkrtchyan also accused Erdoğan of “seeking to keep foreign leaders away from the Armenian commemorations by creating an impromptu -- and historically inaccurate -- anniversary of his own, “ according to an article by Radio Free Europe, Radio Liberty on Jan. 16. Potentially even weirder because there are demonstrations in Washington, New York, San Francisco etc etc. Another Genocide website here - and it mentions the Centennial concert on the 24th in Yerevan - which is kind of where this all started! This looks to me like 3 separate events - the Turkish government's "celebration" of the battle of Gallipoli, the Armenian genocide remembrance ceremony April 24th of this year, and the awards ceremony April 24th of next year. The Turkish government's actions seem so childish to me. Someone you don't like has a birthday party, so you schedule your party for the same day and invite the same people. Now nobody's happy! Infantile! LizzyNY wrote: The Turkish government's actions seem so childish to me. Someone you don't like has a birthday party, so you schedule your party for the same day and invite the same people. Now nobody's happy! Infantile! Hah! I work for a Turkish family and this is EXACTLY what they're like! (I can't speak for the other 80 million of them). Really lovely people but jeez, most days I feel like I'm working in a kindergarten. Anyway, back on topic: as far as I know, the awards ceremony thingy is next year although I can't for the life of me figure out why that would be when it's this year that's the 100th anniversary. Oh well. At least he will miss the KARDASHIANS!! It seems that maybe the Aurora Prize for Awakening Humanity was created recently. Too soon to pick a recipient for this year's 100 Year Anniversary. The prestigious committee which includes George will spend the next several months reviewing possible recipients for next year's prize. Possibly at the 100 Year event on April 24th this award campaign will be officially kicked-off. And this award will be given every year so not just as a nod to the 100th year anniversary. Possibly slightly off topic, but I'm not sure where else this would go, I got this email today at COH which I think was intended for George. I've removed a couple of names as I'm not sure how private this person wanted to be. I feel compelled to share how deeply impressed & proud I feel to witness the extent of what can be achieved when people all over the world band together for a common cause. It's so refreshing to see so many positive reports from all over the world- so many different countries, so many different sources- all helping the healing process through acknowledgment, support and raising awareness- whether it be billboards in subway/metro stations, on highways, dedications, songs, concerts, movies, plays, blood drives, radio shows, news coverage, George & Amal Clooney, Kim Kardashian, Cher, System of a Down- I YOU ALL! What a BEAUTIFUL message for our children and our children’s children- ANYTHING IS POSSIBLE! All you need is tenacity, and putting your minds together to work as one on a common goal- EVEN IF IT TAKES ONE HUNDRED YEARS! Our ancestors- our mothers and fathers, our sisters and brothers, our grandparents, great uncles and aunts must all be so proud watching from the heavens above! One of my "facebook friends" made a comment in a private message that i was “going overboard” with my posts and that they didn't understand "what was the big deal" and "who cares" what happened 100 years ago when there are other "real problems" in the world today......I have to admit I was caught off guard, baffled and dumbfounded... I was about to lose my cool but then I took a deep breath and thought, no- let me try a different approach, a more personal one, an approach that helps put events into context. Some of you who don't share our heritage may not realize just how close to home the atrocities you are hearing about have hit Armenian families living in North America and other places around the world today. I can safely say that the Genocide has in some way touched every Armenian home living in the Diaspora one way or another. We have all lost someone. We've all heard the horror stories. These victims you are hearing about were “real” people. Many of us have photographs of these innocent victims and brave souls in our very own family albums. I’m very proud to tell you about my great uncle, [name removed by katiedot], a rebel leader who saved hundreds [personal information removed by katiedot]. With his flaming red hair and long beard, he looked like the twin of my late brother. I have been told he was quite a sight for sore eyes, riding on his white horse, assuring the safe passage of women and children from the treacherous claws of the Turks. And as a reward for his bravery, he was captured and publicly crucified- as a deterrence to others having similar "rebellious" thoughts. Even as he was brutally tortured, one finger, and one toenail at a time, savagely ripped out from its roots, he wouldn’t give up.....He wouldn’t give up his fellow rebels; he wouldn’t join the Turks; he would not convert. Actually, BOTH my maternal grandparents were also survivors. Sadly, my dad comes from a generation of men who were never open about discussing their "feelings", so, unfortunately I don’t have all the details regarding his side of the family….but, I do know that they too were, indeed, affected, one way or another. Edmund Burke once said “The only thing necessary for the triumph of evil is for good men to do nothing.” You may not be aware but most of those very graphic photographs and film footage of the Armenian Genocide you’ve all been recently seeing everywhere in the media and on the internet, were taken by the Germans who were documenting the Turks mass extermination program in detail. There was plenty of evidence available all the while the massacres were taking place- government telegraphs and newspapers articles are readily found in historical archives. People KNEW what was going on, but CHOSE to turn their heads and look the other way.....And the result......??? Three decades later, on August 22, 1939, Adolf Hitler stated to Reichmarshal Hermann Goering and the commanding generals at Obersalzberg: "Our strength consists in our speed and in our brutality. Genghis Khan led millions of women and children to slaughter - with premeditation and a happy heart. History sees in him solely the founder of a state. It's a matter of indifference to me what a weak western European civilization will say about me….. Who, after all, speaks today of the annihilation of the Armenians?" Part of me, can’t help but wonder, WHAT IF…..what if, AT THAT TIME, the world had ACTUALLY taken the time to listen to cries of the Armenian victims desperately pleading for mercy? What if the Turks had been firmly reprimanded for their heinous crimes…what would have happened?....what if the USA Secretary of State did something upon receipt of the July 16, 1915 "confidential telegraph" sent by US Ambassador to Turkey, Henry Morgenthau? Nipping it in the bud before it had tuned into a full-fledged Genocide?.... IF the Turks had been severely punished at that time, WOULD the Germans have DARED to have the audacity to start their mass extermination campaign? Or was President Wilson's policy of "strict neutrality" during the Armenian Genocide seen as "a green light" by Hitler and his Third Reich? ...Would other, more recent genocides have taken place if measures had been taken in 1915? I don’t have a crystal ball or a time machine. But, it doesn’t take a genius to figure out that THE BEST DETERRENT FOR CRIME IS THE CERTAINTY OF PUNISHMENT. Repeated studies have also conclusively shown this to be true.…In any case, the actual aggressors are now dead, so the time for punishment may have come and gone...but Turkey STILL NEEDS TO ACKNOWLEDGE the evil premeditated deeds of their forefathers. It’s a well-documented fact that a variety of mental disorders are direct consequences of war and genocide. Women are more affected than men. Other vulnerable groups include children, the elderly and the disabled (in the case of Armenian, the elderly and disabled were the first to go- their chance of survival was zero). A study by Murthy and Lakshminarayana stated that "the prevalence of mental illness is associated with the degree of trauma, and the availability of physical and emotional support." Trust me, back then, society certainly was not into “emotional support”; talking about "your feelings" is a luxury of modern society and it was the last thing on the minds of genocide survivors who, after all the trauma already suffered, were then subjected to living through the challenges of the Great Depression that followed in the 1930’s…. Imagine you are a child, and you witnessing your parents, the people you look up to most for protection- your hero, suffering from night terrors…sudden screaming wakes you up in the middle of the night…startled, you jump up and out of your bed, your little heart pounding so hard, you think it’s going to jump right out of your little chest. You run into your parents’ bedroom for protection but instead, you find your father in his undershirt & boxers sitting at the edge of the bed, covered with a cold sweat, neck bent, looking down at his feet, trembling with fear. Your mom has her a hand lovingly on his shoulder...you have no idea what's happening...your father tilts his head back and sees you standing in the doorway. Afraid to look weak, with shame & embarrassment, he flinches his shoulder to get your mom's hand off and he screams at both you, "GET OUT!" of the room...again, you just don't understand. Because you can't understand. Children seeing their parents suffer instinctively try to step up to protect the weaker parent; forced to grow-up unnaturally fast- a feeling of responsibility too heavy a burden for any small child's shoulder's to bear...no child should be forced to endure this feeling of helplessness and inadequacy…or imagine a child of a survivor watching their dad drink his life away, just to forget...even for a moment the horrors they’ve experienced and witnessed….My mom did….or, imagine, coming home from school only to learn that your mom jumped off the building you call home because she could no longer take the pain….My dad did…..Now imagine this on a much larger scale. Not just an isolated incident but an emotional consequence suffered by an ENTIRE nation of people. Imagine growing up hearing all the stories and meeting other people of the same decent in different countries, spread around the world with similar stories and experiences. Now imagine people telling you it never happened; NONE of it- vehemently denying the facts, saying it's all a big lie even the photographs, the old newspaper clippings, the telegraphs. I recently read a very interesting article by Lisa Katz suggesting a "psychological profile” for children of Holocaust survivors, and I believe the same conclusions can be applied to Armenians of the Diaspora. While trauma can be transmitted across the generations, so can resilience. Resilient traits - such as ADAPTABILITY, INITIATIVE, and TENACITY - that enabled survivor-parents to survive the genocide may have been passed on to their children. Studies have shown that survivors and their children have a tendency to be task-oriented and hard workers. They also know how to actively cope with and adapt to challenges. Strong family values are another positive characteristic displayed by many survivors and their children. Within the community, there is polarization based on shared injuries. One the one hand, there is shame over being a victim, and a need to keep defense mechanisms on active alert. On the other hand, there is a need for understanding and recognition. I wouldn’t be who I am today if it were not for my brave ancestors! I am PROUD of my heritage! Throughout the years politicians lobbying for votes at Armenian community centers in both Canada and the USA have promised Armenians that if elected THEY would help to have the 1915 Armenian Genocide recognized. But once in power, time and again, each reneged......I never imagined this day would come.. Over the weekend, the Pope officially recognized the genocide and just yesterday the European Parliament Adopted Bill Urging Turkey to Recognize Genocide. I am so elated and feel privileged to witness the beginning of our healing process as a people. When people come together, hand in hand- anything is possible. Thank you all for letting the healing begin. 1915 NEVER AGAIN! ........Highly readable, and factual, but utterly horrific, article on what happened 100 years ago - in today's Mailonline!! EREVAN. 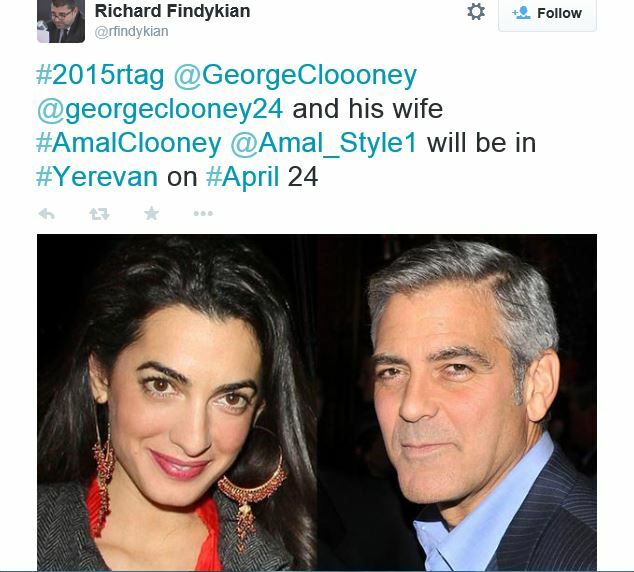 - Hollywood actor George Clooney and his wife, famous lawyer Amal Clooney, will arrive in Armenia on April 22-24. According to the source of Armenian News -NEWS.am, the couple is coming to Armenian to take part in the Armenian Genocide commemoration events. Apart from this, the Hollywood couple will participate in the annual “Aurora” prize-giving ceremony held in the framework of “100 Lives” initiative thanks to the efforts of Moscow-based Armenian businessman Ruben Vardanyan. The awardees will be the people who save others’ lives at their own risk. “100 Lives” initiative co-founder Noubar Afeyan earlier told Armenian News –NEWS.am that they are ready to cooperate with other famous people too if the latter struggle against genocides like George Clooney. .....or timely given the other stuff/perceptions in the press....? We haven't had any article about the award ceremony and who won the award, have we? Marguerite Barankitse is the first recipient of the Aurora award. It is sad such events have to happen in the world we live in, but it is a beautiful thing to see others helping other. I was just able to watch the video of the award ceremony and got quite confused. The pictures and the tone didn't fit, it was deferred for about 15 minutes. Did anybody else have this problem?